Don’t get me wrong, I believe that yoga should be accessible, fun and open to everyone. I think that everyone should take an in-depth yoga training that opens their hearts and minds to the beauty and potential of this extraordinary technology. That passion for sharing yoga with the world has motivated me as a yoga teacher and teacher trainer for over 25 years. But I’ll be honest, that’s not what lead me to register my first 200hr teacher training with Yoga Alliance. That was pure expedience. I’d never wanted to offer a base level teacher training. I know very well that 200hrs training is not enough to become a competent, experienced, safe and thoughtful yoga teacher. I’m happy to start a bar fight with anybody who says otherwise. 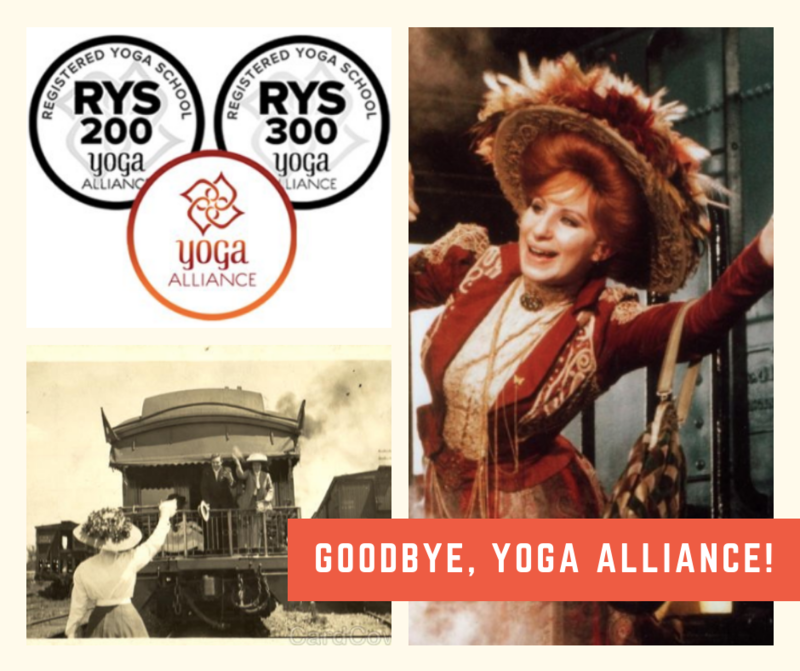 But I DID want to offer a level 2 training for people who already had 200hrs yoga teacher training and figured it would be nice to have a Yoga Alliance 500hr designation for this advanced course. Yoga Alliance didn’t like that idea. I couldn’t register my 300hr training for teachers who already had 200hrs training - a well designed program that had been developed over several years and influenced by the teachings I have been lucky enough to receive from extraordinary teachers in the tradition of Sri Krishnamacharya, including TKV Desikachar, unless I also registered a 200hr training. So I developed a 200hr training and submitted it to Yoga Alliance for approval. And it was approved. Just like that. Yoga Alliance didn't want to know if I was any good as a teacher trainer. Nobody checked to see if my credentials were authentic. Nobody checked up to see if I was delivering the training in the way I’d outlined in my application for registration. I could have been teaching anything at all – cookery, badminton, aromatherapy – then handing out an RYT200 certificate and nobody would have been any the wiser. That’s how it works in Yoga Alliance Land - pay the money, get the accreditation. Let that last paragraph sink in for a moment. Both the general public and candidates for yoga teacher training think that Yoga Alliance accreditation means something. It doesn't. It is completely unregulated. There are no checks and measures - your RYT200 yoga teacher, or the teacher training you've just signed up to, can teach absolutely any amount of nonsense and still claim official accreditation. It's not just bonkers, it's potentially dangerous. Later on down the track, I carefully redeveloped that RYT200 training program to offer as a high-quality stand-alone training. I figured that everybody needs to start somewhere and, since 200hrs was now the standard baseline for yoga teachers, I could at least provide a well written training that was delivered on the premise that this was the first baby step towards becoming a yoga teacher. I was very clear about this in the promotional literature for the 200hr course and throughout the training. This is just stage 1, people. Sure, you’ll be Yoga Alliance accredited at the end of this course, but you should think twice about teaching until you have more training and experience as a student-teacher under your belt. I even told students that I didn’t hire RYT200 teachers at my own studio because it just wasn’t enough training. Me: When did you graduate from your 200hr training? Me: What training have you done since then? Teacher: I use crystals, reiki and essential oils in my classes. Me: Have you done any professional yoga teacher training since graduating? Teacher: My classes are very popular. Me: Do you have a mentor? Teacher: People love the crystal healing. Me: Have you done any yoga training since your 200hr training? Teacher: No, but I have lots of experience. I’ve taught a lot of classes. Do you use essential oils in your classes? It’s very popular. It makes my head hurt. I also became aware of more and more threads on yoga teacher social media groups complaining about the low level of pay for yoga teachers. It goes like this: There are thousands of RYT200 yoga teachers. Many of them work for free because organisations like Lululemon use unpaid teachers to promote their retail products while telling them it's a good way to get experience and a foot in the door. This has normalised the idea that yoga teachers should work for free. Many other teachers are happy to take minimal payments for teaching commercial classes because at least they're getting paid something. No wonder most yoga teachers are working several jobs. No wonder offering novelty packages such as yoga + crystals, essential oils or wine tasking seem more important to many teachers than high quality professional development. Whatever it takes to be 'popular' (ie. paid) wins. The ubiquity of RYT200 yoga teacher trainings and subsequent over supply of teachers has created a race to the bottom. While some teachers remain committed to their personal and professional development, many more are doing minimal training and working for whatever crumbs they can get. I'm done with it. So when my studio's Yoga Alliance registration came up for renewal, I sat down and had a good think. What was I contributing to the world by offering RYT200 teacher trainings? The answer was ‘not much’. So I decided to quit. I’m relinquishing my personal accreditation as an E-RYT and giving up my studio accreditation as a yoga teacher trainer. Goodbye, Yoga Alliance. I'm not against accrediting organisations - if anything, I think yoga teacher training needs stronger regulation. I'm holding on to, and appreciating, the teacher training accreditations that Adore Yoga holds from Yoga Australia and my own much-valued C-IAYT accreditation from the International Association of Yoga Therapists. These organisations have developed systems to ensure their accreditations mean something. Standards are high, the accreditation process is tough and courses are audited to ensure quality control. So what next? I’m focusing all my energy, passion and attention on supporting people who’ve already completed their level 1 yoga training to grow, learn and develop into safe, intelligent and useful teachers. I’m dedicated to equipping yoga teachers with the life-changing tools of Yoga Therapy. I’m passionate about supporting people to learn how to safely and effectively share the benefits of meditation with their communities. I’m developing ongoing professional trainings that are affordable and accessible to all yoga teachers (and are accredited by organisations that care deeply about quality and safety). The world doesn’t need any more RYT200 yoga teachers. But it certainly needs the hope and healing that yoga – taught with integrity – can bring.